This month I watched 10 movies and 2 tv show seasons. Definitely some good things! Nick and Norah's Infinite Playlist- Ahhh good! The book is still better but this was a great adaptation! Also, it has a great soundtrack! Anything Else- I've been meaning to watch this movie for years. It was ok.
Leatherheads- This was a fun movie! I don't really like sports movies but I will make an exception for John Kransinski! Some great scenes in this movie! I liked how they created the era it was set in. Married Life- This was an enjoyable movie as well. I also liked how the era was set in this movie. It had a great plot too! 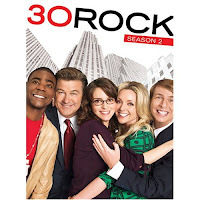 30 Rock Season 2- I can't believe I waited until recently to see this show. Hilarious! The Visitor- This was a powerful movie. A great storyline and definitely relevant for today. The Lather Effect- I really liked this movie. Reminded me a lot of St. Elmo's Fire (which I love!) and the Big Chill! I love ensemble cast movies like this! Goodbye Lenin!- My friend recommended this forever ago! I love the length the son goes to keep his mother happy and comfortable. It's also sort of hilarious at points because of some of the things he does. 30 Days Season 2- I love this show! I wish there were more episodes in a season, only 6. It definitely gets you thinking of the issues at hand, there were some good ones this season including: Immigration, Abortion, and Jail. W.- I was expecting a little more from this movie. It was more than anything sad and since it's based on fact that's really sad. You Don't Mess With the Zohan- I think this is Sandler's wackiest movie yet and I'm not sure that's a good thing. He was very fit in this movie, I couldn't get over that! It's A Boy Girl Thing- Totally cute! I love Freaky Friday and this movie also deals with body swapping but between a girl and a boy neighbor who hate each other. I bet you can't guess what happens! What's the best thing you watched in October? Here is Thursday's Season 3 Premiere of 30 Rock! I really loved Goodbye, Lenin! The best thing I watched in October was Season 1 of The Wire, way back from 2002! It was interesting to see Baltimore's drug world from so many perspectives. charley- The Goodbye, Lenin! soundtrack was nice too! I've never seen the Wire! veens- :D Definitely see Nick and Norah's Infinite Playlist!